As we continue to observe Black History Month, we celebrate the achievements of a notable black Savannahian, Dr. Jim Dandy. Part 2 of his series is, in great part, about perseverance, tenacity and faith. As we mark the 50th Anniversary of the 1964 Civil Rights Act, Dr. Dandy’s struggles, as he moved to Waters Avenue, illuminates for us today, this years’ Black History Month theme, Civil Rights in America. We asked Dr. Dandy, when and why did you move from Abercorn Street? “My practice had grown to the point where I needed more space. I had only one examination room and my brother, Dr. S. Algenon Dandy, was joining me in the practice. Early in 1975, I purchased a 2 story structure at 3709 Waters Avenue from Attorney James Blackburn. The building had originally been the Burns Realty Company. I hired Benjamin Polote to increase the footage of the lower level to accommodate a large Waiting Room, Eye Glass Boutique, Business Office, 2 Exam Rooms, a Visual Fields Room and a Diagnostic Room. The completed addition looked like it was always a part of the original building. 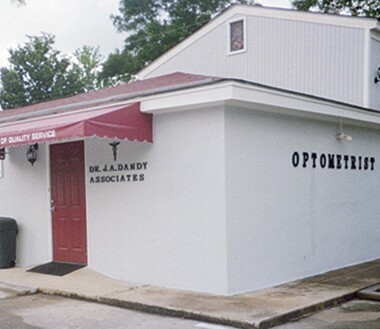 Savannah Family Vision Center was ready to do business. Directly across the street was Dr. Quattlebaum and next to him was Dr, Kessler. I was the only black person in the neighborhood. Actually, I was the first black doctor to open an office on the Southside, or across Victory Drive. The move to Waters Avenue presented a host of shocking experiences and tested my faith and tolerance. I began to practice on Waters Avenue in July 1975. The Nword was spray painted on my building several times. My windows were broken out and my plants and flowers were trampled. Most of this was done at night, but one day, I actually observed a man, from my office window, walking on my flowers and mashing them into the ground. Going out, asking him to stop and being called the N-word to my face and told to leave the neighborhood, required much restraint and strength from the Lord. I had a shovel hidden between the back of the building and the air conditioning unit because each morning I had to clean my parking lot. I would wear jeans, sneakers and a T-shirt to work. This was necessary because persons would bring their dogs to relieve themselves in my parking lot every night. The dog feces were strategically placed at my front door, back door, and all over the parking lot. You can imagine how things would be on Monday morning because they had the whole weekend. Several times I slept in the office overnight, and did a lot of praying; for fear that someone would set the building on fire. This went on for about 2 months until I hired an employee from the community. Soon, families from the neighborhood began to use me as their optometrist and consequently, the spray painting stopped, the parking lot looked the same in the morning as when I left it, the night before, and my practice became about 60% white. I used to make my own glasses. glasses. I bought my own edger and I would do examinations during the day and make the glasses at night. I hired Uleasa Walker Plummer in 1984. She was a quick study and so enthusiastic. I taught her to make glasses, as well. She eventually became my Office Manager, and worked with me at Savannah Family Vision Center until I retired. She still remains in my employee. My brother and I opened a second office in Statesboro, GA. Algenon began practicing with me in August of 1975 and we worked together for about 3 years. I also opened a 3rd practice in Springfield, GA, where I worked two, half days a week. I recruited my brother from teaching high school math. I suppose he had teaching in his blood. He left the practice to become the first black faculty member at his alma mater, Southern College of Optometry in Memphis, Tennessee. He was the first Black to graduate from that college in May of 1975. Along with his faculty position, he was also the Director of the Colleges’, Hayes Eye Clinic in Memphis. In 1979, I began Hart Contact Lenses. Hart was my mother’s maiden name. In 1980, I was appointed the optometrist for the Coastal Correctional Institution. I remained there for 20 years on a part time basis. I was the first doctor, other than the chiropractors, to begin mass advertising and I was heavily criticized. Other doctors believed it to be unprofessional. My sons, Dr. Ronald and Dr. Russell Dandy joined me in practice July of 2003. We practiced together for 6 months until I retired. Dr. Dandy, what were some of the most memorable things that happened during your years of practice? One, I had the opportunity to practice alongside my brother. Two, a dream came true and I was able to practice with my two sons. Three, I was highlighted in the Optical Trade Magazine, Eyecare Business, as being one of the most successful black owned optometry businesses in the United States. As a result of the article, doctors came from all over the country. Black and white doctors called me for tips on how to run a successful business. Some of them actually came to Savannah to spend a day or weekend with me so that I could teach them how to be successful in optometry. I practiced for 32 years, unlike the 8 years at best, that my professors told me that I would be able to perform. 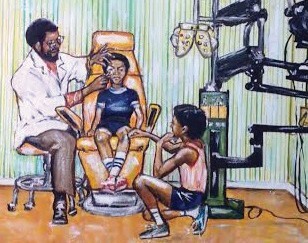 Practicing optometry was a joy to me, so much so that I once went 19 years without taking a vacation. I was forced to retire, because although I had 20/20 central vision, I had no side vision. I saw my last patient on January 17, 2004. I was devastated. I waited until everyone had left, and I cried aloud and asked God why? I truly missed practicing because I loved people, I loved my patients and they loved me. I can say truthfully, that I actually loved coming to work every day. It took a while, but with God’s help, I began to live with the continuing loss of my sight and the absence of my beloved practice at Savannah Family Vision Center. It is true that if you trust and wait on the Lord, when He closes one door, He can and will open another for you. Next week, Series 3 “Recruitment”.